IC443 is a large supernova remnant with an apparent diameter of 50′ in the constellaiton of Gemini. Age estimates vary widely from 3,000 to 30,000 years ago. It is a bright, visual object, but is also a strong radio and X-Ray source. There are some reports that IC 443 is comprised of three shell-like structures; two of which are connected having different radii and centers, whereas the third is attributed to a much older supernova remant. The supernova explosion interacted with a large molecular cloud. North is up and the image is ~ 42′ x 42′. Astrodon 3 nm H-a, SII and OIII narrowband and Generation 2 RGB filters were used. The Hubble color palette was used where Red = SII, Green = H-a and Blue = OIII. 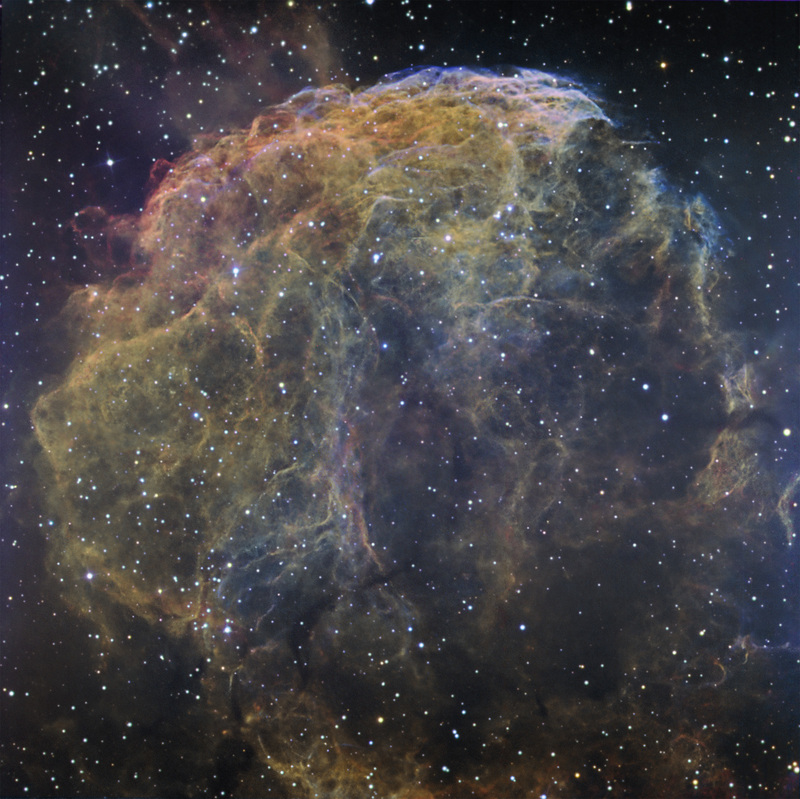 Stars from RGB filters were blended into the final narrowband composite. Narrowband sub-exposures were 30 min. each. The Apogee U16M camera was operated at -25C. The system was guided with an SBIG ST-402 on an Astrodon MonsterMOAG off-axis guider. Data were acquired automatically with CCDAutoPilot4 running MaximDL4.62 with Pinpoint for image link. Data were calibrated and processed in CCDStack and Photoshop CS3.